One of the key sights to see in Montreal is the rather impressive Notre Dame Basilica. You will feel overwhelmed by this awe inspiring Neo-Gothic church that’s big enough to hold 4,000 worshipers. Saint Joseph’s Oratory is also worth a visit; it’s a national shrine and the country's largest church. 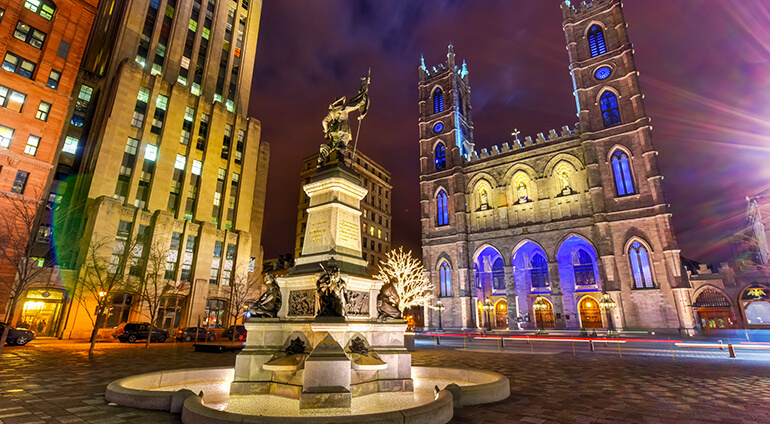 A trip to Montreal wouldn’t be complete without spending some time in the charming old town, which is the historic centre of the city. Visit the highest spot in the city at 234 metres at Mount Royal, Montreal’s most beautiful city park that covers part of a mountain. There’s also Montreal Botanical Garden, which contains 75 acres of thematic gardens and greenhouses. Take some time out of your trip to go walking or cycling along the Lachine Canal, which is a National Historic Site with 14 kilometres of bicycle and pedestrian pathways. Another big tourist attraction is the Montreal Biodome, which was originally built for the 1976 Olympics, and is a now a centre featuring replicas of four different ecosystems that can be found in the Americas. Families will enjoy La Ronde, a big amusement park with all sorts of fun rides. Kids and adults interested in nature will also enjoy Montreal Insectarium and the Montreal Biosphere, a museum dedicated to the environment.